Welcome to the AM update. Next up is news from Portugal and the RS:X European Championships. After completing 10 and 11 races respectively, the mens\’ and ladies\’ fleets anxiously awaited the arrival of the wind for the medal races on the final day in Madeira yesterday. Sadly, the wind never showed, meaning the current tied leaders Przemyslaw Miarczynski from Poland and Byron Kokkalanis from Greece were announced as winners in the men\’s fleet. The ladies overall winner was Spanish sailor Marina Alabau with a decisive 24-point lead. You can read the full report from the final day HERE and check out the video from Day 6 below. Windsurf holiday company Sportif are pleased to announce the plans for their new Greek centre, Sigri. This summer will see the EFPT and Michael Rossmeir\’s Trickademy making stops on the island of Lesvos – proving what a fantastic location it is. The picturesque resort has some excellent wind stats, find out more and check out some great deals over on the Sportif website. Seabreeze.com.au have just finished up their \’Visions of Summer\’ photo contest. Tasked with encapsulating what summer is all about, there were some great entries which you can view HERE. 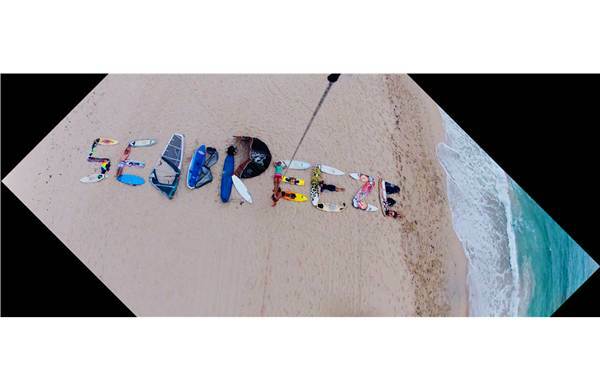 The awesome winning photo, compiled of water equipment and shot using a kite, is below. Out on Maui and Diony Guadagnino has returner to join the Hot Sails Maui team as they test next years\’ sails. To celebrate his return, the team took a break from the office and headed out to sail Ho\’okipa. Check out a nice gallery HERE. 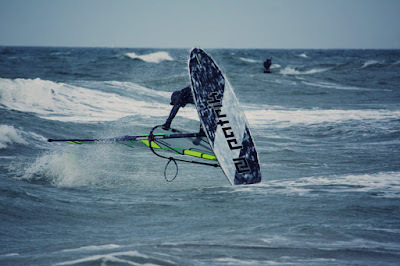 Blogging away is German ripper Mathias Genkel with some cool (literally) shots from a session last weekend. Check out Mat\’s page HERE. Transatlantic trooper Sarah Hebert has now completed 1/3 of her trip across the wild ocean. With winds of around 25 knots propelling her on, Sarah is making excellent progress as she heads to Guadaloupe. Keep up with Sarah\’s exploits HERE. Wrapping up the AM update is news that UMI have announced the winners of their Bonaire Video Editing competition. The winner of a holiday to Bonaire for his sick edit of Kiri, Taty and Tonky is Marc Broersma. Check out his edit below and the results being announced by Kiri and Taty HERE. Don\’t forget to drop by later for the PM update with some awesome videos and Timelapse Friday!